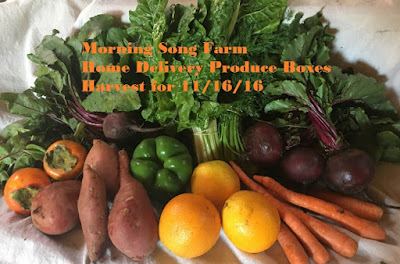 Here's a shot of what we plan on harvesting for our Home Delivery Farm Boxes for November 16, 2016. (We only have a few group deliveries now, most of our members have opted for Home Delivery in communities that we offer it in.) Fyi, this week's Hachiya persimmons need to be fully ripe! They're more like a pudding fruit than anything else. If you get impatient and try biting into one of these pretty fruits before they're ready, you won't do it again. Just awful! They're also wonderful dried, almost like candy.